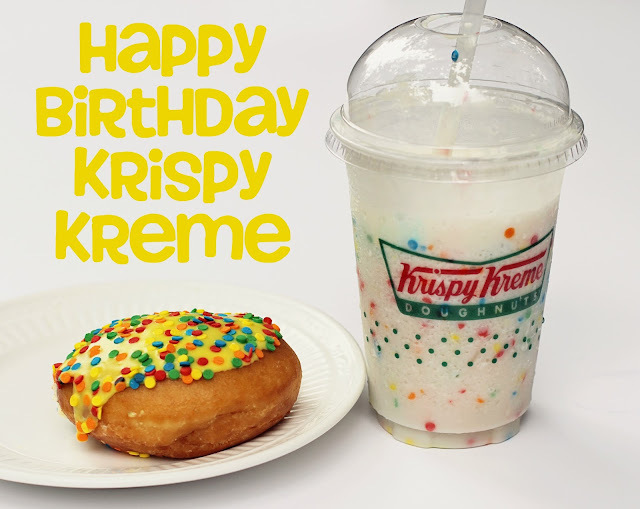 Did you all have any idea that Krispy Kreme Doughnuts turns 78 years old tomorrow? I had no clue that this doughnut giant had been around for so long. 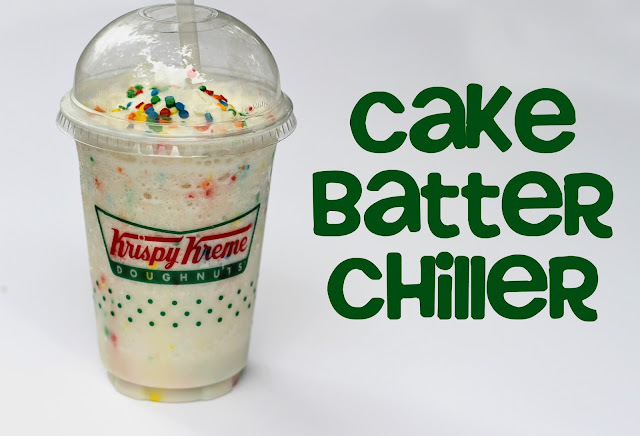 In honor of the birthday bash, Krispy Kreme has a couple of new fun menu items that we got to check out. 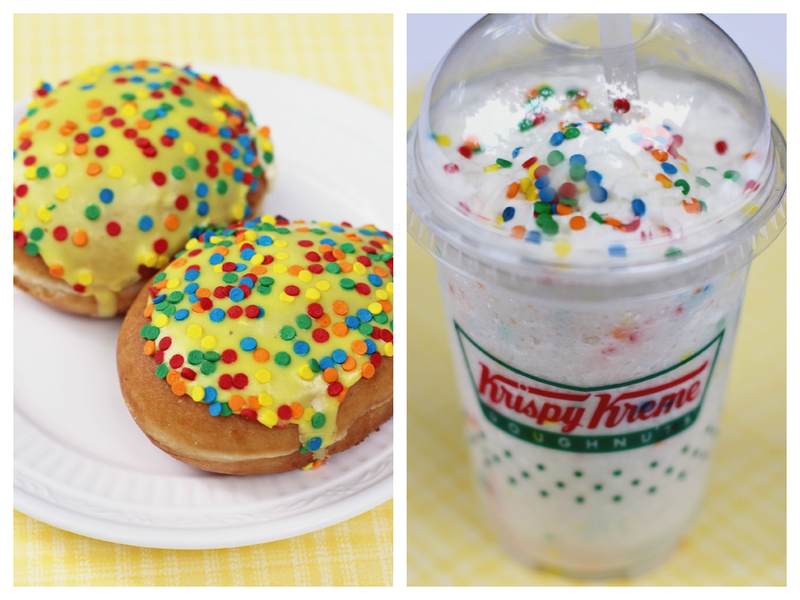 Now through the end of August, you can try the new birthday cake batter doughnut (with cake batter flavored filling and bright sprinkles) or the birthday cake chiller (a creamy cupcake flavored iced beverage). Or maybe if you're in the mood for something chocolate (like I always am), you could try the brownie batter doughnut, with a filling that tastes just like licking the beaters. They're all amazing. I know because I ate them ALL. In the name of research. This is dedication to my craft. 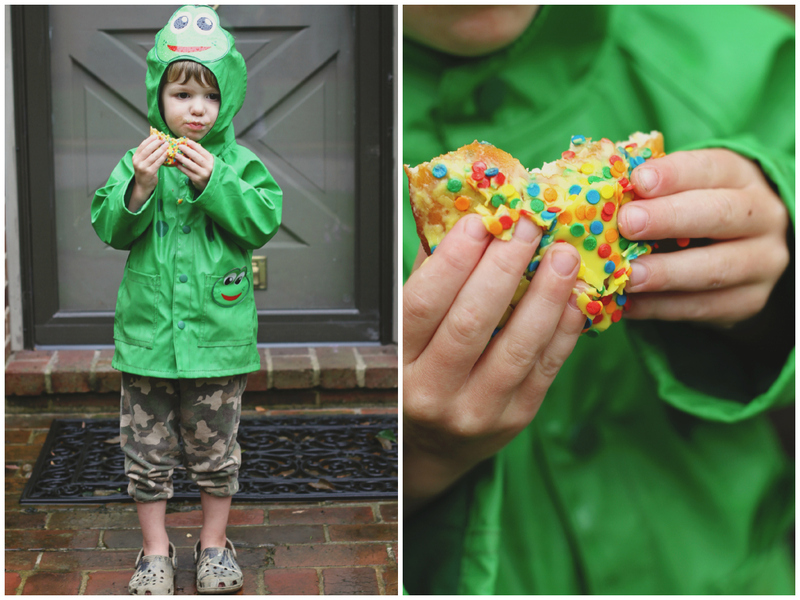 Seriously, sometimes this whole blogging gig is just too amazing to be true. Want to know who else is pretty excited about doughnuts? 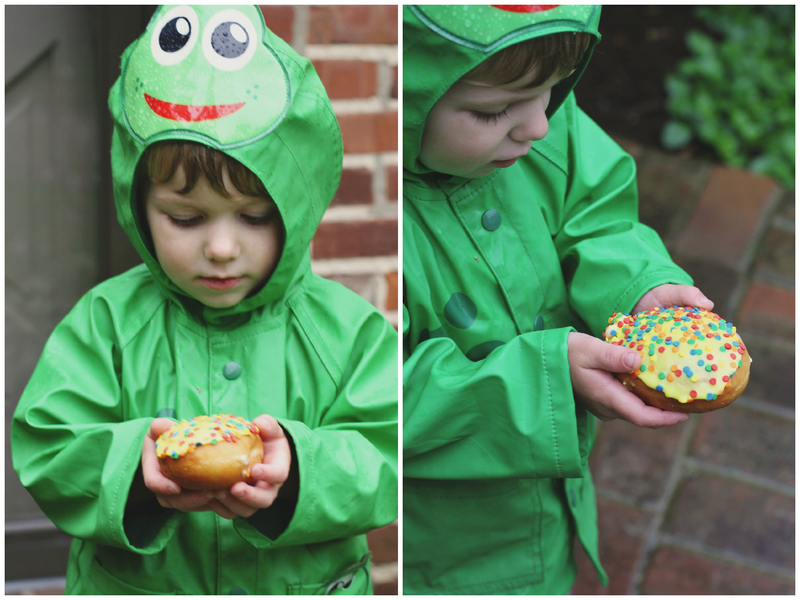 Don't you all eat your doughnuts on the front porch in the rain too? The funny thing is, I had this whole elaborate scenario in my heard about how I was going to surprise Mac with a Krispy Kreme doughnut. 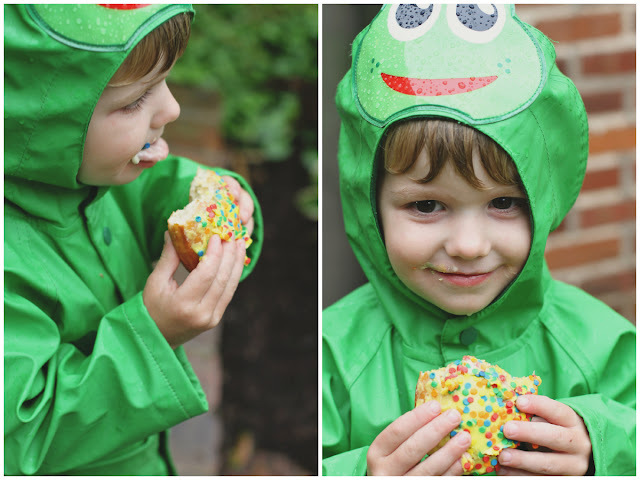 He's only had a doughnut once (that I know of), and of course he loved it, so I made plans to meet up with some friends that all had kids his age and we'd have some fun park play time and a doughnut date. I was going to get pictures of all the kids sitting at a picnic table, chowing down on doughnuts, with sprinkles stuck to their face and their sticky little fingers. Adorable, right? 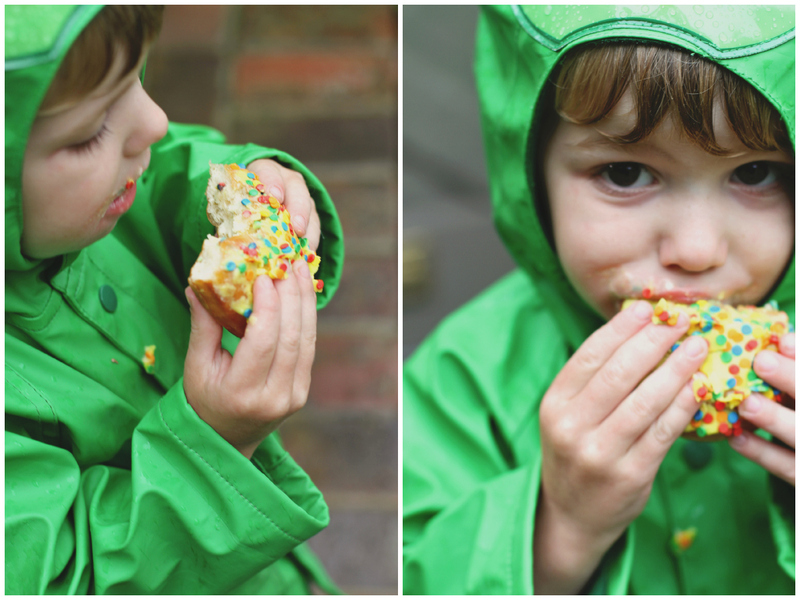 I finally just got so fed up with the rain that I hit the Krispy Kreme drive through on my way home from work and surprised Mac with a fun after-nap snack of a birthday cake batter doughnut. So, instead of being the cool mom that set up the fun doughnut date with all his little buddies, I'm the mediocre mom that just lets her kid eat doughnuts on the front porch in the pouring down rain in his weird little green frog rain coat. Know what? I don't think Mac cared one bit. That kid is the best. 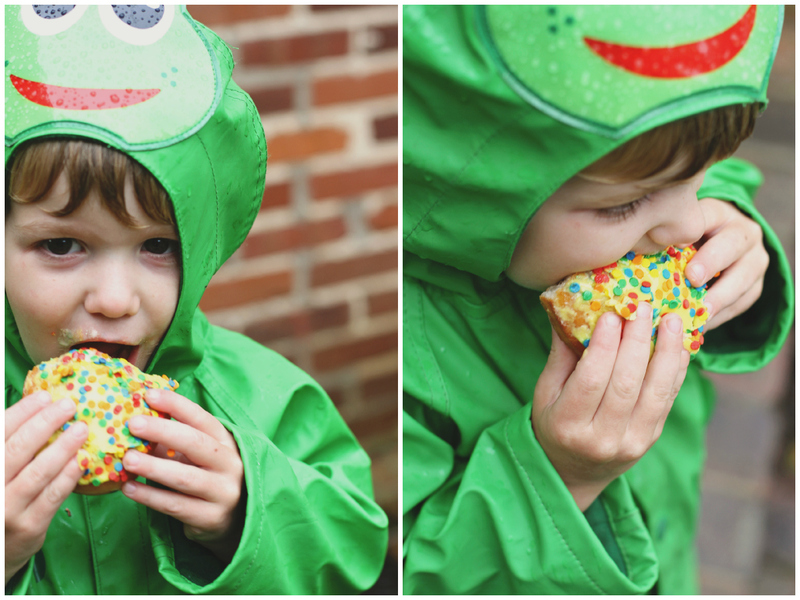 Needless to say, Mac was a big fan of the doughnuts. 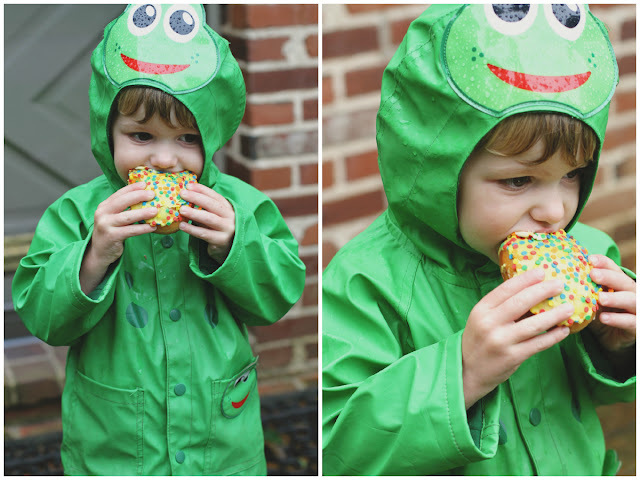 He destroyed his and immediately asked for more (I said no and he cried). I only ate three, which I think showed incredible restraint and willpower. 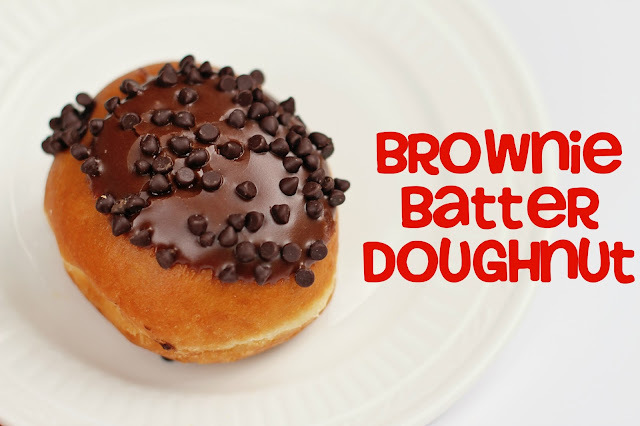 The brownie batter ones were to die for. 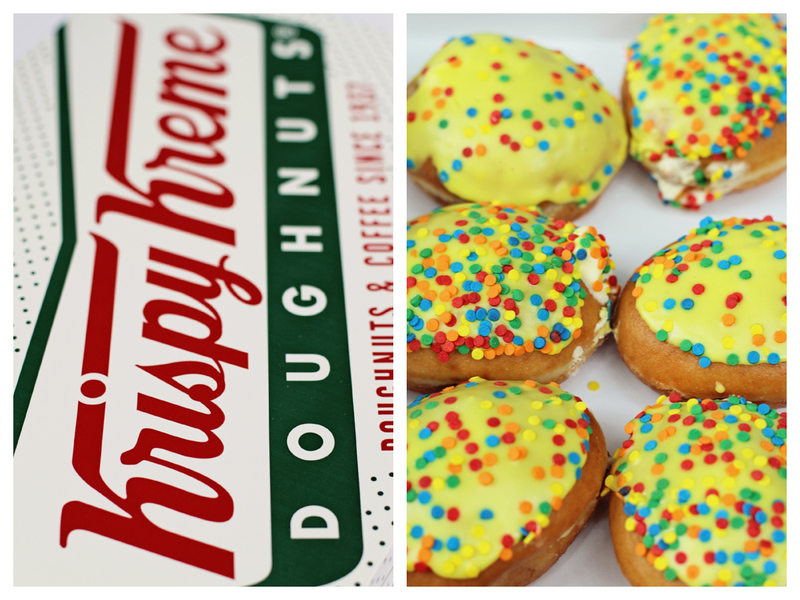 And I'm not just rubbing it in that WE got doughnuts...there's good news for you, too! Tomorrow is Krispy Kreme's 78th birthday, so if you purchase one dozen doughnuts tomorrow, you can get a dozen Original Glazed doughnuts for just 78 cents. Did you hear that? That's worth repeating...78 cents for a DOZEN doughnuts. Run, don't walk to your nearest store. Any Krispy Kreme fans out there? What would you do with an extra dozen doughnuts? 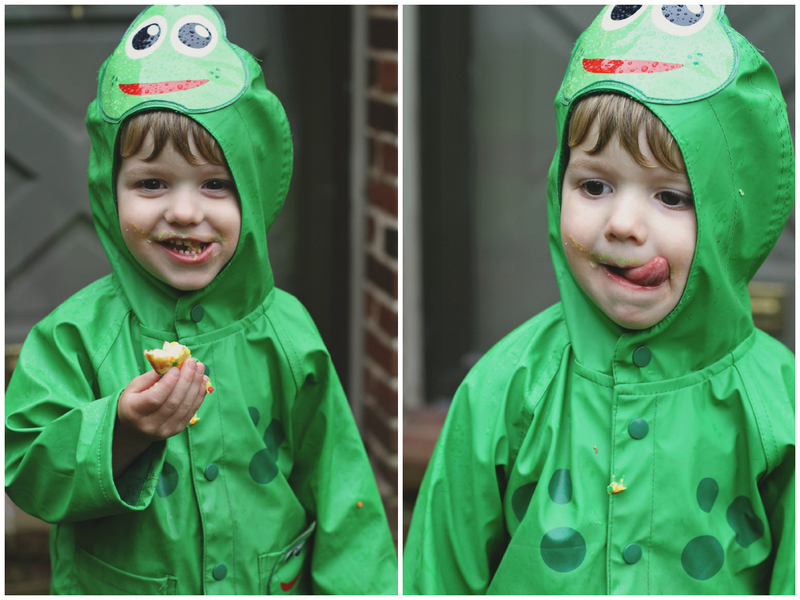 I love letting Carter eat messy things out on the porch and he thinks it is the grandest thing in the world! 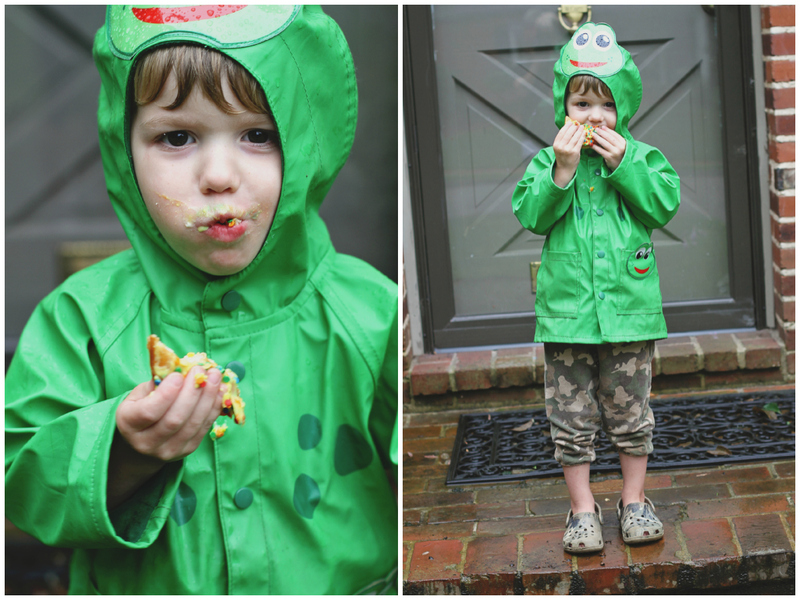 But then I have to fight him for every meal after that to convince him that we don't eat on the porch all of the time. LOL toddlers are such a mess. These pictures are so cute! Mac is growing up. My nearest Krispy Kreme is 2 hours away and I cry about it on the regular. Give me more Krispy Kreme!! They seriously have the best doughnuts in the world. Holy crap!! You just made my day. Course even though Krispie Kreme originAted here and has there headquarters not far from here we don't have an actual Krispie Kreme shop nearby. It's 30 minutes away. Dang it!!!! 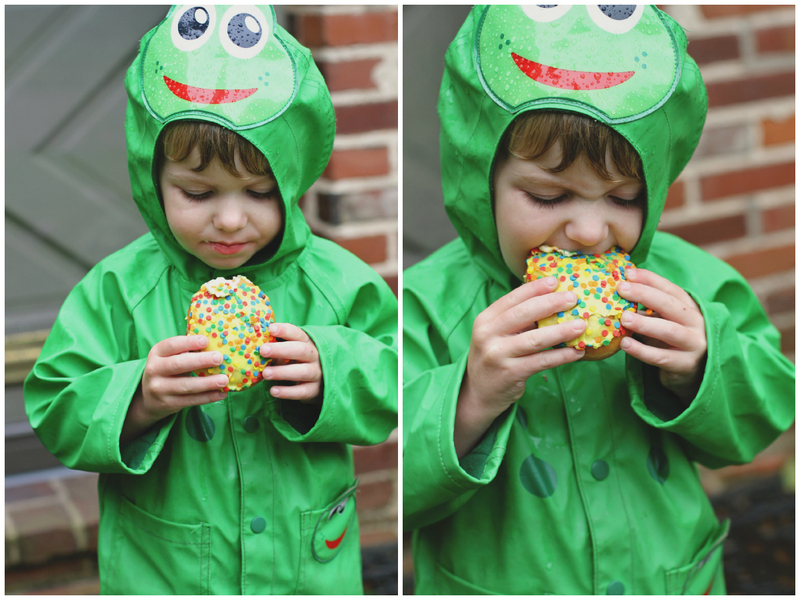 I want those donuts! And you are not a mediocre momma, you are awesome for thinking of that as an after nap snack. He was one happy kid and I don't blame him. oh my gosh...heaven in a post. I want some donuts now. Oh. my. gosh. Yes, please, to ALL of the doughnuts. We've lived in LA for 5+ years and I have yet to see an actual Krispy Kreme store. WTF?! I could go for about a dozen cake batter doughnuts right this second. I love Krispey Kreme. We don't have them here. I mean, you can get the plain glazed ones in some gas stations, but not the variety of the stores. 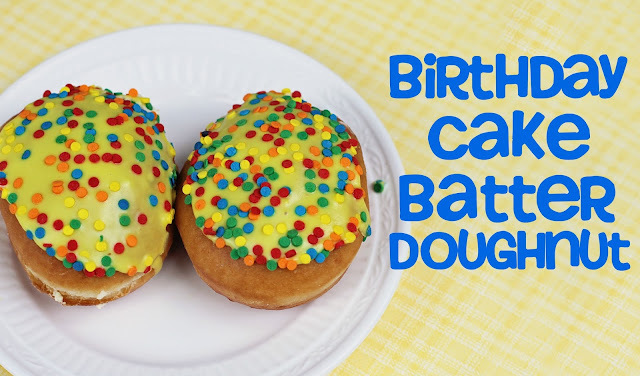 You had me at cake batter doughnut. Oh I wish we had a Krispy Kreme by U.S.! Looks delicious! We don't have a Krispy Kreme near me and it makes me so sad. We can buy boxes of their donuts in the grocery store but I've heard the freshly made ones are so much better! Oh yum! The nearest Krispy Kreme is over 35-45 minutes from us. Good for my waistline, I suppose. 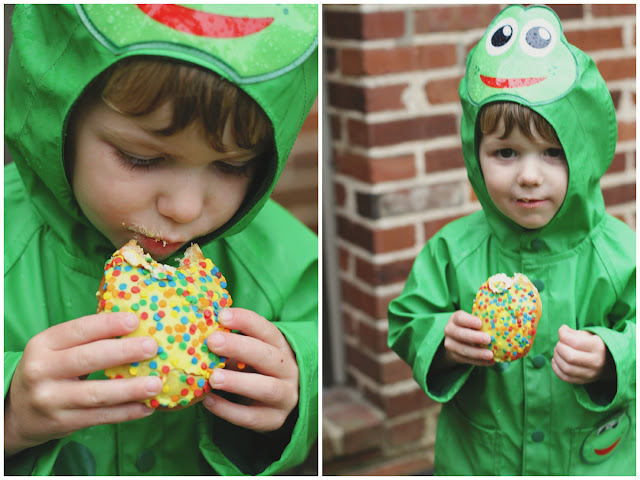 But goodness these pictures make me want to hop in my car and drive there right now. I know a little five year old that would happily oblige! 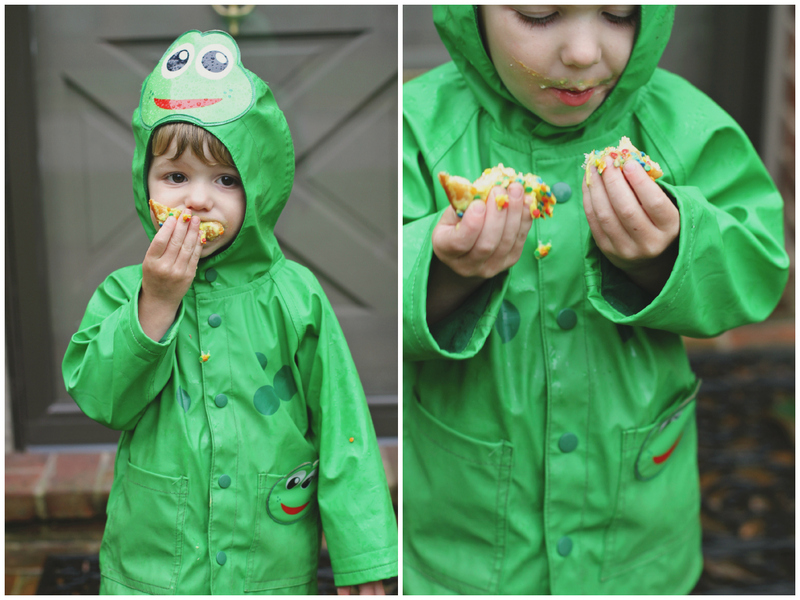 Love the pictures of him eating his donuts in the rain. 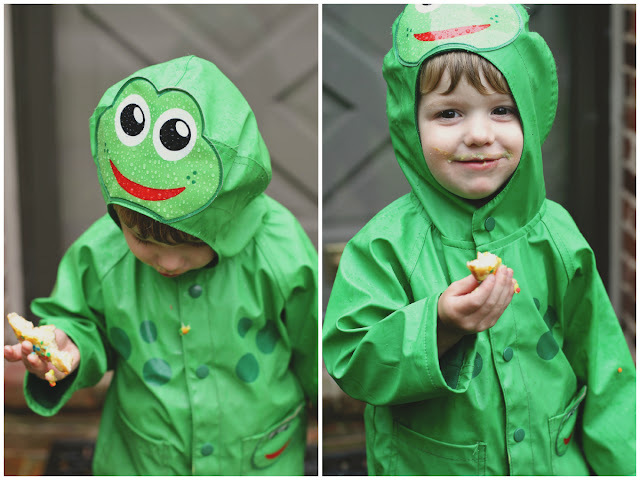 Adorable rain jacket, too! !